Archaeologists discovered the remains in 2008 in one of a series of Iron Age pits on the site of the University’s £750 million campus expansion at Heslington East. Brain material was still in the skull which dates back around 2500 years making it one the oldest surviving brains in Europe. A multi-disciplinary team of scientists, including archaeologists, chemists, bio-archaeologists and neurologists, was assembled to attempt to establish how the man’s brain, could have survived when all the other soft tissue had decayed leaving only the bone. The team is also investigating details of the man’s death and burial that may have contributed to the survival of what is normally highly vulnerable soft tissue. The research, which was funded by the University of York and English Heritage, is published in theJournal of Archaeological Science. Archaeologists from York Archaeological Trust, commissioned by the University to carry out the exploratory dig before building work on the campus expansion started, discovered the solitary skull face-down in the pit in dark brown organic rich, soft sandy clay. 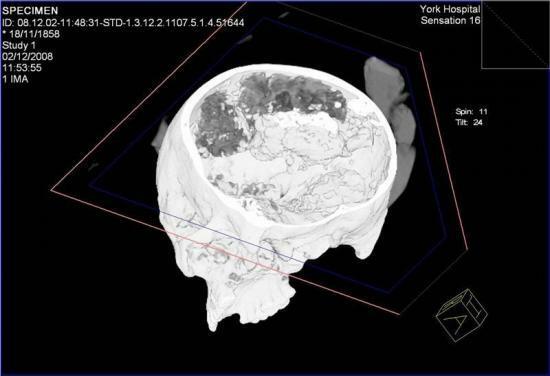 Since the discovery, the brain and skull have been kept in strictly controlled conditions, but scientists have examined samples using a range of sophisticated equipment including a CT scanner at York Hospital and mass spectrometers at the University of York. Peri-mortem fractures on the second neck vertebrae are consistent with a traumatic spondylolisthesis and a cluster of about nine horizontal fine cut-marks made by a thin-bladed instrument, such as a knife, are visible on the frontal aspect of the centrum. Histological studies found remnants of brain tissue structures and highly sensitive neuroimmunological techniques, together with analyses, demonstrated the presence of a range of lipids and brain specific proteins in the remains. The scientific team is now investigating how these lipids and proteins may have combined to form the persistent material of the surviving brain and what insight this may give on the circumstances between death, the burial environment and preservation of the Heslington brain. The team is headed by Dr Sonia O’Connor, a Research Fellow in Archaeological Sciences at the University of Bradford and an Honorary Visiting Fellow at the University of York. It included scientists from the Departments of Archaeology, Biology and Chemistry at York, Archaeological Sciences at the University of Bradford, the Biocentre and the Department of Laboratory Medicine at Manchester University and the UCL Institute of Neurology in London. Despite the place that ‘trophy heads’ appear to have played in Iron Age societies and evidence for the preservation of human remains in the Bronze Age, the researchers say there is no evidence for that in this case. Analyses found no biomarkers indicating deliberate preservation by embalming or smoking.